If the recording option is dimmed, your audio might not be connected. Click the mic icon to connect audio, then try again. When you’re done, click Stop Recording. When your recording has been processed, you can access it to play or send to others. 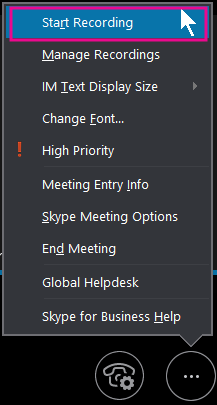 Skype for Business displays a message when the recording is ready. You can click the alert to open Recording Manager, or if you miss that, click Tools on the Skype for Business main window, then Recording Manager. Click your recording to highlight it, then click Play on the right side of the window. You can also rename or delete your recording here. To share your recording with others, click Browse to locate it, then copy the file to post on a shared location, such as OneDrive or an internal SharePoint site. If you cannot post the recording, check to make sure you have enough space on the page. Tip: Recordings are saved in the Videos/Skype for Business Recordings folder on your computer. For more information, see Skype for Business Recording Manager.